The test exploited the intense gravitational field around the monster black hole at the heart of our Milky Way galaxy. In the latest test, an international team of astronomers used a giant telescope in Chile to observe a star as it moved through the intense gravitational field of a black hole — and found that light from the star was stretched by the gravity just as Einstein's iconic theory said it would be. The finding, described in a paper published July 26 in the journal "Astronomy and Astrophysics," capped more than two decades of research. There have been many tests of relativity over the years, but this was the first involving a supermassive black hole — in this case Sagittarius A*, the monster lurking at the core of our Milky Way galaxy some 26,000 light-years from Earth. "It shows, unsurprisingly but exquisitely, that gravity is governed by Einstein's general theory of relativity and not Newton's law of universal attraction," Pedro Ferreira, an astrophysicist at the University of Oxford, said of the finding in an email to NBC News MACH. 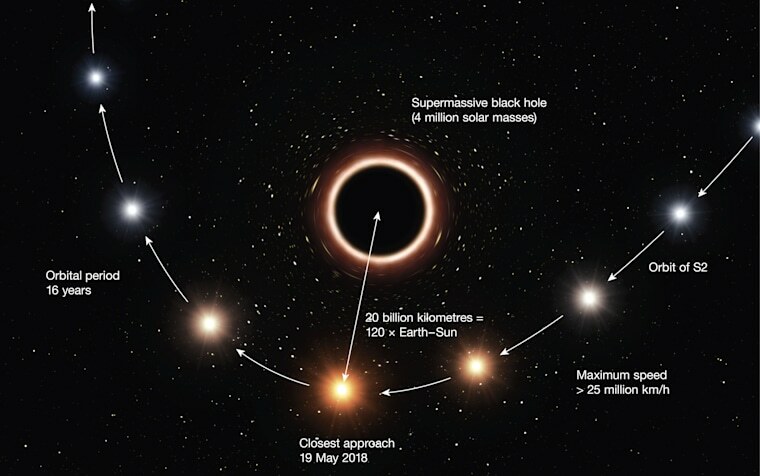 "Not a particularly new result — we have known this since 1915 — but it is now measured in a new regime, relatively close to a supermassive black hole." Ferreira, an expert on general relativity, was not involved in the new research. The star involved in the test, designated S2, orbits Sagittarius A* at speeds of up to 25 million kilometers per hour (16 million miles per hour or more than 4,000 miles a second). Using the Very Large Telescope in Chile's Atacama Desert, the astronomers compared light reaching Earth from S2 when it was near the black hole and when it was far away on its highly elliptical orbit. They found that the wavelength of light from S2 becomes longer when the star draws close to Sagittarius A*. That phenomenon is known as "gravitational redshifting" because as the starlight passes through an intense gravitational field its photons lose energy, causing the color of the light to turn a bit more reddish. "This is predicted by Einstein's theory of general relativity, and we have precisely seen that effect," Stefan Gillessen, a staff scientist at the Max Planck Institute for Extraterrestrial Physics in Garching, Germany, and a member of the team of astronomers, told MACH in an email. "The light got redshifted by exactly the amount it should." Gilessen said there is "no real doubt" that Einstein's theory is correct when it comes to the behavior of celestial objects — but that research has established that relativity doesn't work for the subatomic realm. "Hence it makes sense to test Einstein's theory in as many systems as possible and see whether it fails somewhere." Sean Carroll, a physicist at Caltech, agreed with that assessment. "He could be wrong someday," Carroll said of Einstein in an email to MACH. "And keep in mind, showing that Einstein's theory doesn't work means an automatic Nobel Prize. So it's worth looking, even if it's a long shot." WANT MORE STORIES ABOUT THE BIG QUESTIONS?